Take 1 teaspoon of turmeric powder, 1 teaspoon of red sandalwood powder, 1 teaspoon of lemon juice, 2 teaspoons of milk, 1 teaspoon of almond oil and one egg white. Mix them well and apply this mixture on your face for and neck for 15 minutes. 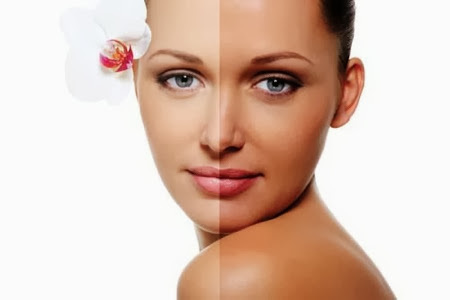 Regular application will give you an excellent result within few days. Take 1 tablespoon of honey and 2 tablespoons of sour cream. Apply this mixture to your face and allow it to sit for at least 15-20 minutes then clean it with soft and moist cloth and finally wash off with fresh water. Mix oatmeal with curd and tomato juice and apply on your face and neck. Keep it on for 20 minutes and then wash it off with cold water. It helps to remove the sun tan and lightens the melanin spots. Almond face whitening mask has been shown excellent results for skin lightening. Take 5-7 almonds and soak them overnight. Next day peel them off and add some fat free milk and rose water to make a thick paste. Now apply this paste on your face and neck for 15-20 minutes and then rinse with water. A table spoon of gram flour(besan) mixed with 2 table spoon of raw milk and 2-3 drops of lime juice works well for lightening dark skin. Apply this mixture and leave it for 15 minutes before washing off. For best results repeat this on regular basis at least for 2 week or until you get the desired result. Take 1/2 a cup of rice flour, and 1/2 a cup of mashed ripe papaya. Add the juice of 1/2 a lime. Wash the face with water and gently apply this paste on face and neck by your fingers then gently massage in circular motion with help of your fingertips. After 15 minutes rinse off with warm water. For Best results repeat this twice per week.After skin exfoliation don't forget to apply a good moisturizer to prevent dryness. Take 1 tablespoon of Dried orange peels and 1 table spoon of dried Lemon Peels. Mix 2 table spoons of curd(yogurt). Blend them well and then gently apply on face and neck and massage in circular motion for 2-3 minutes. Leave this mixture for 10-15 minutes, then rinse off. This scrub is best for dry skin. After skin exfoliation don't forget to apply a good moisturizer to prevent dryness. You can make a natural scrub by mixing 2 tablespoons of oatmeal, 2 tablespoons of sugar, and a quarter cup of milk. Blend the mixture until it was semi-solid. Apply to face and neck and massage in a circular motion. Let it stay for 10-15 minutes and then wash your face.Finally apply a good moisturizer. This skin exfoliating scrub is best for all skin types. (i)Avoid direct exposure to U.V Sun rays because production of melanin increases in presence of UV Sun rays. Before going out apply a sunscreen that has a sun protection factor (SPF) to all parts of your body that will be exposed to the sun if you are outdoors. (ii)Try to consume foods rich in Vitamin A,C and E because these vitamins not only reduce melanin production but also help in skin lightening. (iii)Try to drink at least 10-12 glasses of water on daily basis. Water not only prevents from skin dehydration but also flushes out toxins and keeps your skin blemish free.